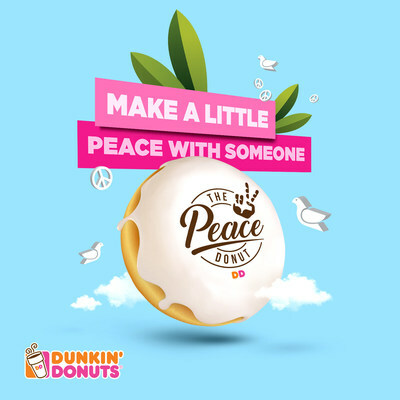 DUBAI, UAE, September 21, 2018/PRNewswire/ –Inspired by the upcoming World Peace Day, Dunkin Donuts UAE has launched what it considers to be a small gesture with a big impact: The Peace Donut. With the message ‘Make a little peace with someone’, The Peace Donut has been specially created around the simple human truth that peace starts in our own hearts. And the more at peace we are with each other, the better the chances of peace around the world. People will be invited to send The Peace Donut to a friend, relative or colleague with whom they feel they’re not at peace. A simple gesture to help both of them shake off the burden of discomfort with each other. The limited edition Peace Donut is available in over 24 outlets across Dubai, Sharjah and Abu Dhabi from 20th till 23rd of September. During this period, people can also send The Peace Donut through Dunkin’ Donuts delivery partner “Carriage”. It’s delivered in a specially made box and senders will be able to add their personal message. More Information about the initiative is available on ThePeaceDonut.com microsite. June 11, 2018 Asianet Pakistan Comments Off on ‫برهان الدبدوب يخمن نتائج مباريات كرة القدم!